Tomorrow is Earth Day. Around here we are a little bit green and growing crunchier with each passing year, but we don’t really “celebrate” Earth Day per se. This year, however, I thought I’d share a great Earth Day initiative with you. NAP, Inc., the makers of the fabulous Sleepy Wrap and Boba Baby Carrier, is partnering with PlantABillion.org to provide each of us an opportunity to help with reforestation efforts. For every new Facebook fan or Twitter follower this week, NAP, Inc. will plant a tree. All you have to do to help in this effort is click on the links below and become a fan or follower. How easy is that?! NAP, Inc. is a very eco-concious company who strives to reduce, reuse, and recycle wherever possible. For more information on their Earth Day Celebration, check out the post on their Facebook page (click the link). And a disclaimer (just in case): no compensation was provided in exchange for this post. I just feel it’s a great (and easy) way for each of us to plant trees. Those of you who know me (or have read here for a while) know that I’ve fallen in love with babywearing since Boo was born. So, when Steph mentioned earlier in the week that she was going to host a “babywearing stash” link-up I knew I wanted to play along. I’m contemplating making some changes to the stash as the arrival of baby #3 approaches – possibly adding an ERGO, maybe selling the green/blue sling, and Matt would really like a Kelty backpack. But this is where I am right now. 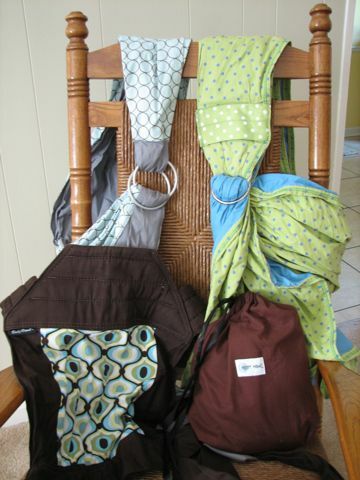 If you want to see how other bloggers are babywearing, check out the stash link-up. 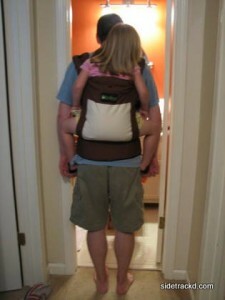 When Little was a baby I had a standard front carrier with all of the straps and buckles and what-not. I used it until she was 5 or 6 months old and she was long enough that her feet hit against my legs (almost at my knees; I’m vertically challenged) and she was heavy enough that it hurt my back if I wore her for any length of time. I enjoyed having her in the carrier, but it made my back ache and I was constantly struggling to keep the straps tight enough to keep her in the right position. 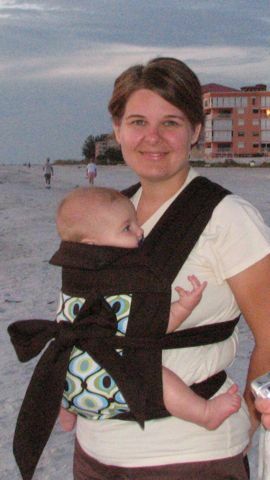 When I found out I was expecting Boo, I knew I wanted to be a babywearing Momma, and I knew that I wanted a different type of carrier. 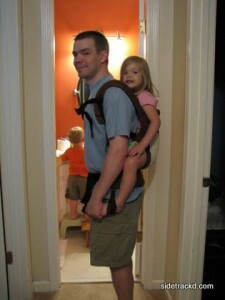 I did some research, found some answers to questions at Adventures In Babywearing (Thanks, Steph! ), and became a little more educated about what types of carriers are available. In December my nephew was born, and my SIL was singing the praises of her Sleepy Wrap. Based on her recommendation, I purchased a wrap and started wearing Boo when he was a couple of weeks old. Boo and I have both loved our Sleepy Wrap. In fact, it has saved my sanity on more than one occasion when he has been super fussy. I tie it on, pop him in, and he is generally off to sleep in a matter of minutes. Now that it is HOT in my part of the world, we need something that is a little cooler on both of us. I decided a few weeks ago to get a pouch or sling and began searching for just the right one. It took me several hours of surfing to settle on this pouch. I received it a couple of weeks ago, but have had a bit of trouble getting the right size/fit. After shrinking it yesterday, I think I’ve finally got it to the correct size. Boo rode in it yesterday afternoon for the first time and seemed to like it; again, he was asleep in minutes. Then, I was talking to Lu on Monday about different carrier options and the issues I was having with my pouch. We started looking around a bit at various websites and on eBay and I stumbled upon a ring sling that I fell in love with. It is an adorable lime green with blue polka dots cotton fabric. So, I bid on it and won the auction! I’m awaiting it’s arrival in the mail any day now. I still want a mei tai, and I’m sure I could come up with a few more if pressed. And then last night at Lu’s place I saw a link to a great giveaway that I just had to sign up for: Along for the Ride is holding a contest to Win the Essential Babywearing Stash from Along for the Ride (one Beco Butterfly, one Hotsling baby pouch, one BabyHawk Mei Tai, one Zolowear Ring Sling, and one Gypsy Mama Wrap). I mean, what babywearing Momma could resist a chance to win five (count ‘em…one, two, three, four, five) new carriers including the mei tai that’s on my list? I’m telling ya, it truly is an addiction; I mean, this is more fun than shopping for shoes! You are currently browsing the archives for the Babywearing category.